Preeclampsia is a hypertensive disorder that can complicate pregnancy and can cause maternal and prenatal mortality and morbidity. Timely intervention by healthcare providers can save the mother and the baby. Swelling and high albumin in the urine during the 20th week or the first week after delivery is common in preeclampsia patients. Bloating of the face and hands often known as edema is caused due to accumulation of excess fluids. The American College of Obstetricians and Gynecologists (ACOG) in 2013 informed that proteinuria may not be a cause for preeclampsia. Eclampsia causes spastic seizures that is not due to a brain condition and can lead to coma, if left unattended or untreated. Factors like diet, genetics, and conditions related to blood vessels, can lead to eclampsia. Healthcare providers are still not sure what exactly causes the condition. Though, in most cases it is followed by preeclampsia. Nearly 5% of women develop preeclampsia especially during their first pregnancy. Women already having complaints of high blood pressure or vascular disease before pregnancy, have a high risk of preeclampsia. 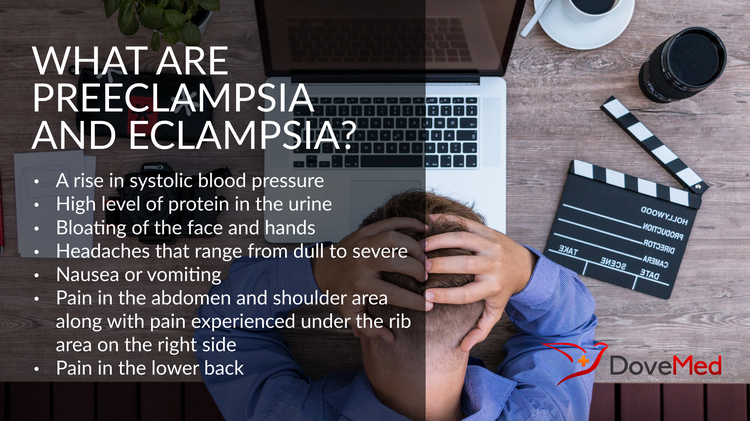 Leaving preeclampsia untreated can lead to eclampsia. This condition can become fatal, if left untreated. The placenta detaches itself early in the pregnant women having this condition. a lack of blood flow to the placenta can result in preterm birth and breathing disorder in the baby. A life-threatening condition called ‘HELLP’ that causes disintegration of red blood cells, low platelet count and high secretion of liver enzymes may occur. Preeclampsia can lead to cardiovascular disease. Constant monitoring is needed for pregnant women who suffer from headaches, vision disorder, faint fetal heartbeat and vaginal bleeding. Preeclampsia can be diagnosed with a series of blood tests and urine tests. Tests of liver function can also help identify the condition. Strict bed rest is recommended for woman with mild preeclampsia. August P, et al. Preeclampsia: Clinical features and diagnosis. http://www.uptodate.com/home. Hypertension in pregnancy. Washington, D.C.: American College of Obstetricians and Gynecologists. 2013. Duley L, Henderson-Smart D, Meher S. Altered dietary salt for preventing pre-eclampsia, and its complications. Cochrane Database of Systematic Review, 2005, (4):CD005548. ACOG Committee on Obstetric Practice. (2002). Practice bulletin# 33: diagnosis and management of preeclampsia and eclampsia. Obstetrics & Gynecology, 99(1), 159-167. Martin, J. N., Thigpen, B. D., Moore, R. C., Rose, C. H., Cushman, J., & May, W. (2005). Stroke and severe preeclampsia and eclampsia: a paradigm shift focusing on systolic blood pressure. Obstetrics & Gynecology, 105(2), 246-254. Katz, V. L., Farmer, R., & Kuller, J. A. (2000). Preeclampsia into eclampsia: toward a new paradigm. American journal of obstetrics and gynecology, 182(6), 1389-1396. Duley, L. (2009, June). The global impact of pre-eclampsia and eclampsia. In Seminars in perinatology (Vol. 33, No. 3, pp. 130-137). WB Saunders. Goldenberg, R. L., Jones, B., Griffin, J. B., Rouse, D. J., Kamath‐Rayne, B. D., Trivedi, N., & McClure, E. M. (2015). Reducing maternal mortality from preeclampsia and eclampsia in low‐resource countries–what should work?. Acta obstetricia et gynecologica Scandinavica, 94(2), 148-155. Thornton, C., Dahlen, H., Korda, A., & Hennessy, A. (2013). The incidence of preeclampsia and eclampsia and associated maternal mortality in Australia from population-linked datasets: 2000-2008. American journal of obstetrics and gynecology, 208(6), 476-e1. Chesley, L. C., & Tepper, I. (1957). Plasma levels of magnesium attained in magnesium sulfate therapy for preeclampsia and eclampsia. Surgical Clinics of North America, 37(2), 353-367.